This blog presents you the Original Murano Glass handmade in Venice. Here you can find Jewellery, Lighting, Mirrors, Furnitures, Ornaments, Sculptures and Tableware, all handmade with the Original Venetian Glass. All the posts in this Blog are directed to the site MuranoNet. ...and all products are Made in Italy. 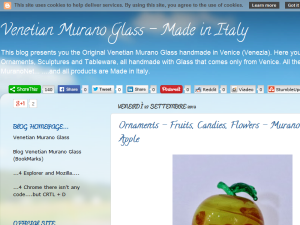 This what your Venetian Murano Glass - Made in Italy Blog Ad will look like to visitors! Of course you will want to use keywords and ad targeting to get the most out of your ad campaign! So purchase an ad space today before there all gone! If you are the owner of Venetian Murano Glass - Made in Italy, or someone who enjoys this blog why not upgrade it to a Featured Listing or Permanent Listing?